When European settlers arrived on the scene, the Bluegrass region was in use as a hunting ground for numerous Native American tribes. Daniel Boone was one of the first Anglo-Saxons to explore the area. He helped establish Kentucky's first forts in Harrodsburg and Boonesborough. Lexington was founded in 1775, seventeen years before Kentucky became a state. William McConnell and a group of frontier explorers were camped at a natural spring when word came from nearby Fort Boonesborough that the first battle of the American Revolution had been fought in Lexington, Massachusetts. In honor of the battle, the group named their site "Lexington". By 1820, Lexington, Kentucky, was one of the largest and wealthiest towns west of the Allegheny Mountains. So cultured was its lifestyle, our city soon gained the nickname "Athens of the West." If you are on a "smart" phone, you'll automatically be re-directed to the .mobi version of the website when you go to www.visitlex.com. Browse attractions, restaurants, hotels, the Events Calendar, photos and more. Our mobile site is equipped with geo-location, so be sure you have location services turned on when you get to Lexington, not just for your phone, but also within the web browser that you use on your phone. Then you can view listings and sort by "nearest me" and also get driving directions. Super cool, right? A tablet version of the Lexington Visitor Planning Guide is available on iPad, iPhone, Android Tablet, Android Phone and Kindle Fire. Download the free app here. Within a day's drive of two-thirds of the population of the United States, Lexington is strategically located at the intersection of interstates 64 and 75 in Fayette County, Kentucky. (See map. ) Lexington is accessible by air with approximately 100 direct and nonstop flights. Nestled among world famous Thoroughbred horse farms, Blue Grass Airport (LEX) welcomes travelers with one of the most beautiful air approaches in the nation. To view a list of airlines that service LEX, click here. The city is set up like a wheel with spokes, with main arterial roads running from downtown out into horse country. Major car rental companies have desks at the airport and branches around town. Public bus service is provided by LexTran and the free Colt Trolley system serves downtown. Visitors also have access to a number of cab companies. A great way to see horse country is with a van tour company. Click here for more about transportation options. See this link for a street map of the central downtown district in PDF format. Lextran (The Transit Authority of Lexington, Ky.) is Lexington's public transportation system. Lextran operates a fleet of 73 buses, including a University of Kentucky campus shuttle service, and contracts a door-to door Paratransit service through Red Cross WHEELS. Their mainline bus service runs from 5:30 a.m. until 12:30 a.m. Regular bus fare is one dollar and includes unlimited transfers on a one way trip. Other reduced fares, as well as a variety of pass programs are also available to individuals that qualify. Climb aboard Lexington’s eye-catching trolley bus service and tour Lexington’s scenic downtown in style! The COLT Trolley is Lexington’s popular free downtown circulator service, operated by Lextran. 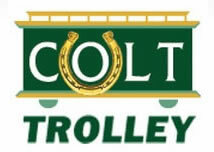 COLT Trolley connects the Lexington Center and Rupp Arena with the Lexington Visitors Center, Thoroughbred Park, the main Lextran bus terminal, the University of Kentucky Campus, Transylvania University, the historic Chevy Chase neighborhood, and all the great restaurants, bars, theaters, and shops in-between. Hop on or hop off as you choose. The clean and comfortable COLT Trolleys are a great way to enjoy Lexington’s nightlife, and although the trolley buses look historical, two of them are actually hybrid-electric; the first hybrids to be used for public transit in Lexington. Each COLT Trolley bus holds approximately 25 people and can accommodate riders with disabilities. Lexington Center meets all public facility structural and service requirements as set forth in the Americans with Disabilities Act (ADA) and provides convenient accessible parking areas. All levels of Lexington Center are accessible by elevator. Entrances are equipped with ramps and automatic doors and all restrooms are wheelchair accessible. When you are in the Horse Capital of the World, be sure to stop by the downtown Visitor Center, 401 West Main Street, in The Square. Look for the awning with the famous blue horse, Big Lex. We are open Monday through Friday from 8:30 a.m. to 5 p.m., and Saturdays from 10 a.m. to 5 p.m. (Open Sunday afternoons from noon till 5 p.m. in the summer.) Speak with a Visitor Information Specialist, browse our informative brochures and maps, watch videos about the Bluegrass Region on one of five interactive screens and check out our Bourbon still and other memorabilia.